I fear I may be overly generous, but nevertheless I am giving this film 1 star (mostly because they all seem to have turned up, and I always feel you should give points for trying). I was sceptical to say the least before watching this, and it thoroughly lived down to my expectations in every way. At first glance this would appear to be your usual run-of-the-mill teen horror flick, which indeed it is, only without the teenagers, which is bizarre. After about an hour into the film, you begin to wonder whether it wouldn't be more accurately titled "Lost at Sea with Two Hysterical Women and an Idiot". There are, I am sure, many attempts at generating suspense and possibly even horror, but for the most part rather than caring who goes next, you just find yourself shouting "Eat the one that keeps screeching!" The acting. Well there is certainly a lot of it (rather too much in a lot of places in fact). The main cast consists of only 5 people, the unlikely named Damien Walshe-Howling as the main character (Luke), as well as Zoe Naylor (Kate), Adrienne Pickering (Suzie), Gyton Grantley (Matt) and Kieran Darcy-Smith (Warren). Between them these poor hapless actors are forced to contend with a poor script and an unlikely feeling storyline. On the plus side however, the great white sharks used in the filming are extremely talented and may well expect Oscars for their performances. The attempts at creating atmosphere seem to fall down partly due to the lack of any sort of soundtrack (at least not that I noticed). They rely instead entirely on the sound of the waves splashing, which frankly gets very tedious, very quickly. Contrast this to Jaws, which this film likes to compare itself to, which had an ongoing "peril" theme which we still recognise today. This, combined with a lack of character generation and the fact that you never actually see the sharks attack, leads to a fairly uninteresting hour and a half. 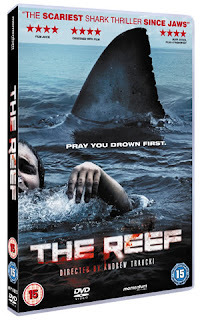 For those who haven't already lost the will to live, there are two special features available on the DVD, The Making Of The Reef (in which they amusingly describe the film as a "Survival Thriller" even though neither of those terms particularly apply) and the Theatrical Trailer, although why you would want to watch that after watching the film is anybody's guess. In summary I would have to say that my favourite part of this DVD was definitely the trailer for Skyline, which looks like a very entertaining film.